Home / psychology / 4 Manipulation Tactics Toxic People Use to Silence You! Not everyone you come into contact with is going to be a source of peace and joy. In fact, some are going to be the exact opposite. They’ll bring nothing but toxicity to your life and make you constantly doubt your rights. The worst part is that you often don’t even realize how toxic such people are until they’ve embedded themselves into your life. They could be your best friend, business partner or even your spouse. 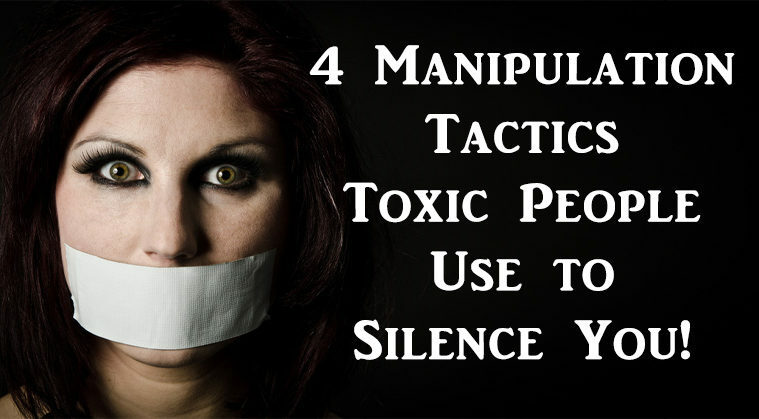 You can protect yourself by becoming aware of the tactics toxic people often use to trap people in a web of confusion. Let’s dive right into a few of them. Gaslighting is the process of manipulating another person into questioning their own sanity and rights. Gaslighting presents itself in three stages. This leads to the depression stage. If you suspect someone is toxic, look for the signs. Is he or she constantly questioning your feelings during your interactions? Some people are experts at running you round and round in circles when you ask them a pointed question they don’t want to answer. One tactic toxic people use to do this is known as word salad. Put simply, it’s an elaborate response that certainly makes someone sound like they know what they’re saying. But really, they’re just trying to place themselves above others by confusing the heck out of everyone. Think politicians. An easy way to spot this is to pay attention to how arguments with a suspected toxic person tend to go. Do they stay focused on the topic or are they constantly bouncing around and bringing up things that have zero relevance? Another way toxic people can confuse you is by convincing you that they’ve got you all figured out – that they know exactly why you do the things you do. Statements like “I shouldn’t be surprised,” or “I figured you’d say that” in response to even mundane things you do are signs that a toxic person is trying to get into your head. It’s a form of delusional reasoning that simply does not respond to logic or common sense. No matter how hard you try to put a toxic person on the spot, they will throw the fire right back at you and catch you in an infinite game of hot potato. To a toxic person, the problem is never theirs. Even when faced with undeniable blame in a situation, they’ll find a way to push some of it back on you. Toxic people are human too. They’re not monsters that should be thrown in a room and locked up away from society. They need help, professional help. Don’t expect that you will be able to change your toxic spouse or best friend for the better. If they’re not willing to get help and it’s having an impact on your well-being, maybe it’s time to take a step back. If the toxic person is a coworker or boss, consider getting help for yourself whenever the toxicity is too much to bear.